Remember when you were a child, how excited you were exploring the seashore and tide pools on the beach? 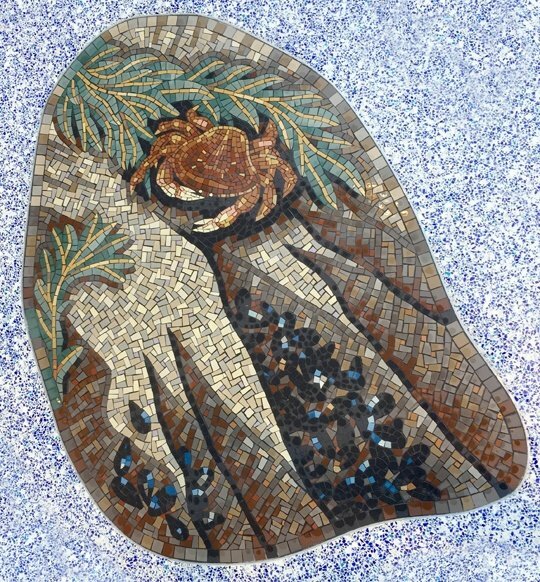 This was Gary’s inspiration for this series of ten mosaic panels, terrazzo design and bronze cast sand dollars. 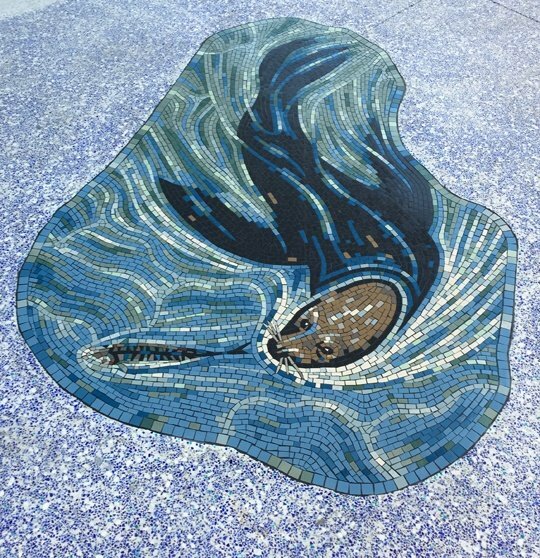 This trail of California seashore mosaics evoke a walk along the California seashore. 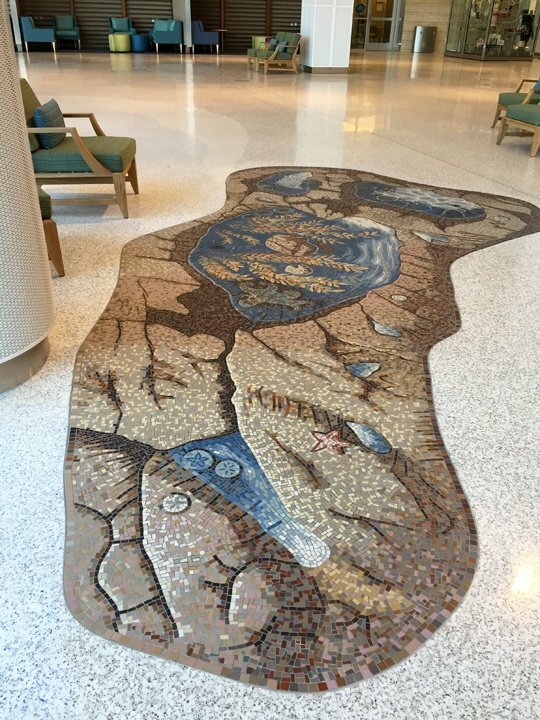 Here is a look at these California seashore mosaics for the main lobby of the new Stanford, Lucile Packard Children’s Hospital, opened in December 2017 in Palo Alto, California. Leatherback turtle chasing jellyfish mosaic. 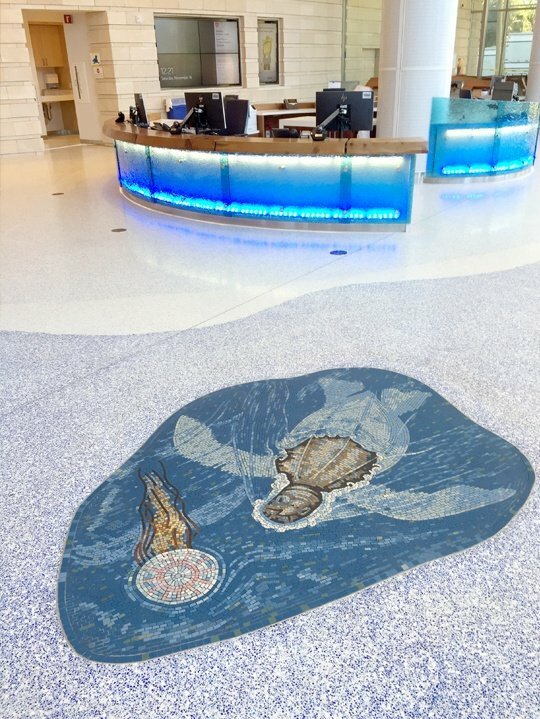 This view shows the terrazzo shoreline and the cast bronze sand dollars (also installed by Drostle Public Arts) around the seashore themed reception desk. The new Lucile Packard Children’s Hospital is set to be the flagship hospital for the inclusion and integration of art in hospitals. This modern, high tech building is filled with original and inspiring art around every corner. The hospital aims to provide it’s patients, staff and visitors with an environment that is welcoming, friendly, interesting and fun. Certainly a far cry from the old utilitarian hospital design. 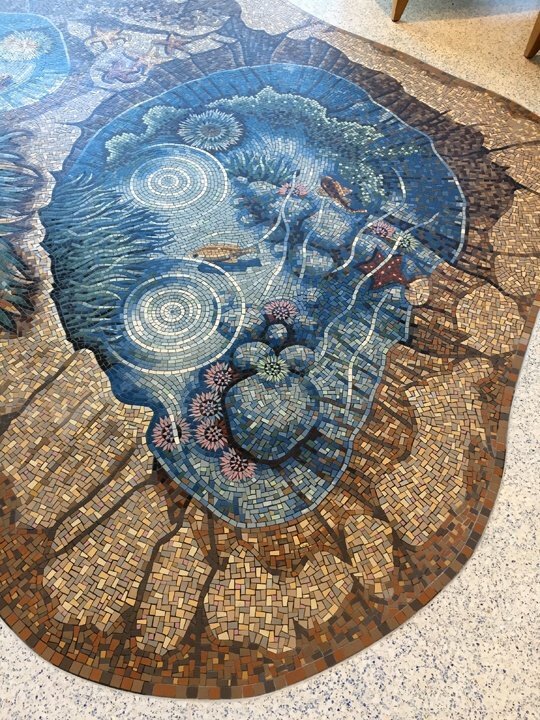 It is into this space that the California seashore mosaics were to be set. Using art to enhance the environment has a proven track record in healthcare provision. In fact Gary‘s very first job was painting murals in hospitals. Nowhere are these benefits felt more than in the provision of children’s health services. 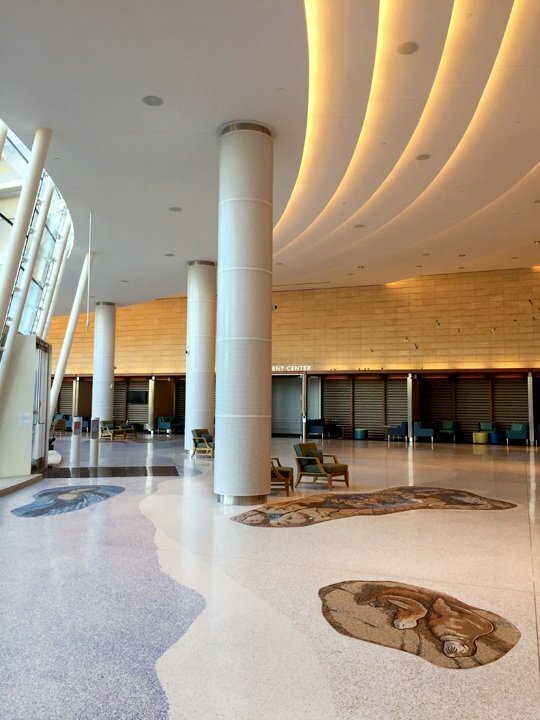 The new Stanford Children’s hospital is packed full of sculptures, mural panels, photographs, information panels and mosaic art. 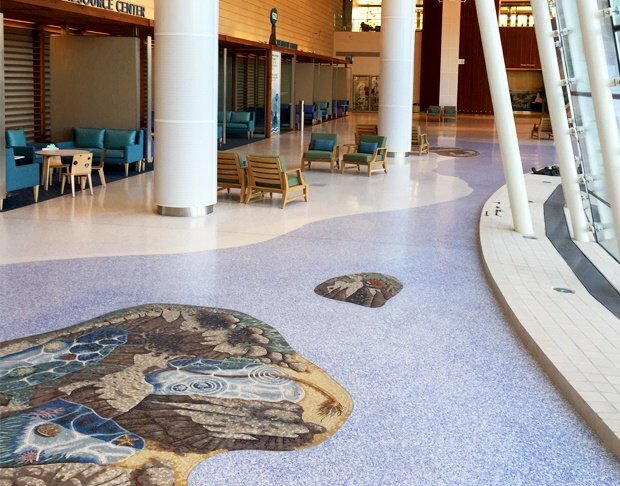 This hospital sets the standard for what art can do in the healthcare environment. 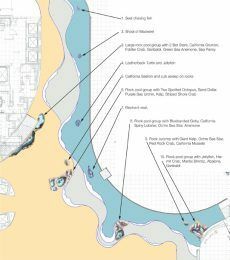 Gary designed the ground floor terrazzo to echo the seashore. Along this seashore Gary placed ten mosaic panels. 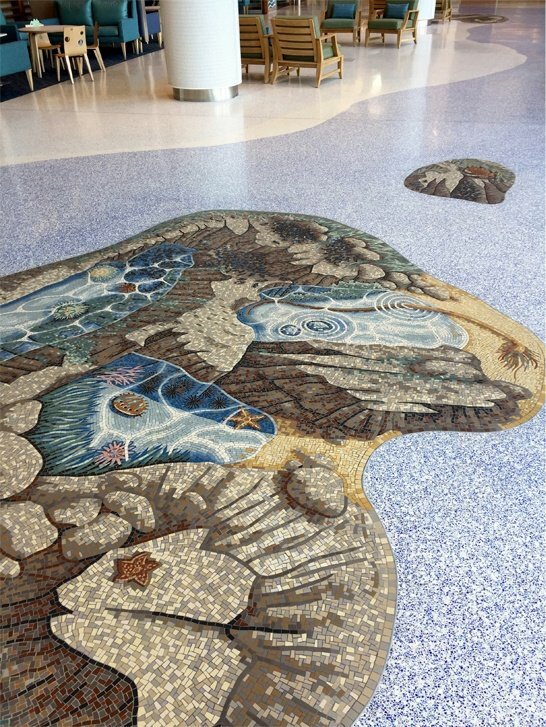 “The idea was to create the California seashore mosaics as discovery points across the floor, each panel containing differing flora and fauna of the California seashore that visitors could explore from one to another”. Terrazzo: A technique of mixing coloured stones and other materials with cements that is poured wet onto the floor and then ground and polished to form a decorative surface. In this case Gary used a palette of four colours to create a seashore design. 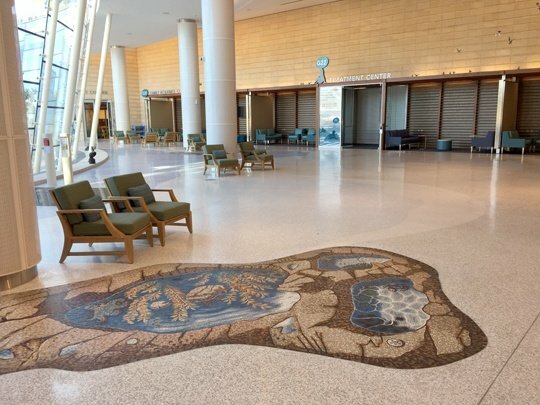 The ten mosaic panels designed for the floor were set out to draw the visitor into and around the lobby space. The idea was to act like a discovery trail where children could move from one panel to another finding different creatures at each point. The first set of panels are located in the ‘sea’ area of terrazzo as you enter the building from the main entrance. Right at the entrance you find a seal chasing a mackerel. 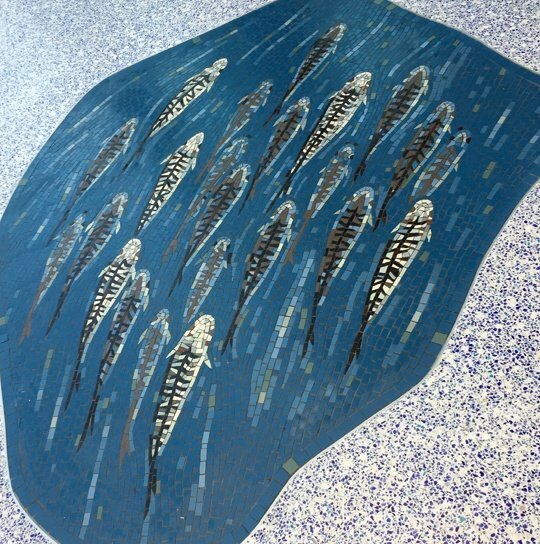 Then as you enter the building you encounter a shoal of mackerel, perhaps fleeing the seal. As you approach the reception desk you will find a leatherback turtle hunting a jellyfish, also at this point in the building Gary set out six sand dollars around the reception desk to act as markers, these were cast in bronze. Approaching the shore swimming through the shallows we can see the giant shape of a California Elephant Seal. 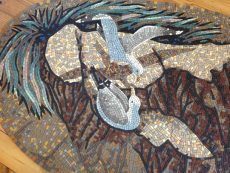 The next six mosaic panels are a series of rocky outcrops on the shoreline. Here Gary wanted to recreate the joy of discovering and searching tide pools as a child. In each of the pools different local flora and fauna can be discovered: Crabs; sea urchins; seaweeds; shellfish; small fish; Sea Lion and pup and a host of different treasures of the California seashore. 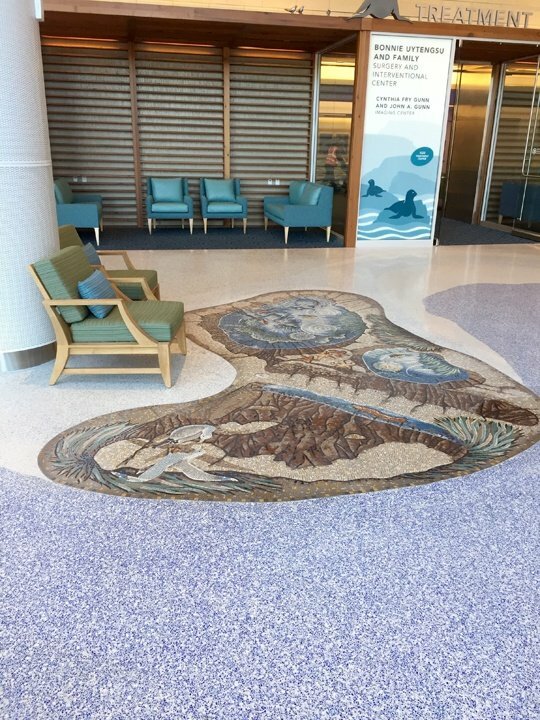 This series of California seashore mosaics was one of two series completed for the new hospital: ‘A Walk along the California Seashore’ for the ground floor; and ‘A Trail through the Redwood Forest‘ for the first floor. Seagull panel cartoon in the studio. 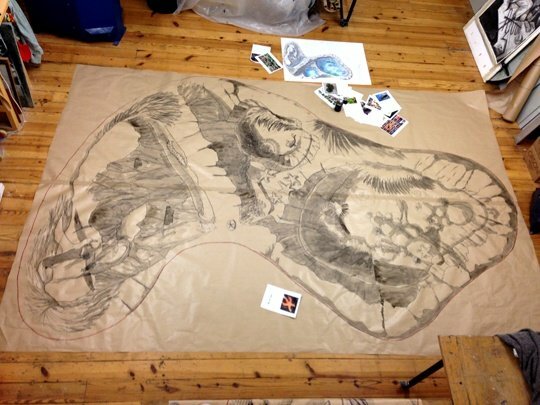 Here you can see the original design and the full scale cartoon for the mosaic along with various reference photographs for the flora and fauna. 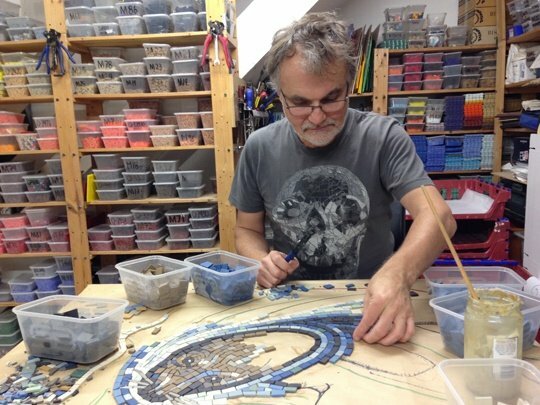 Once designed and approved all the mosaics were made in Gary‘s studio in London. Using unglazed ceramic, porcelain, and the traditional paper faced reverse technique, each tile (tesserae) carefully cut and glued, by hand, onto a full scale paper cartoon of the design. In order to ensure that the mosaic panels matched the terrazzo floor, rigid templates were made for each panel. These were used to create the mosaic cartoon and then to fix on site before the terrazzo was poured. 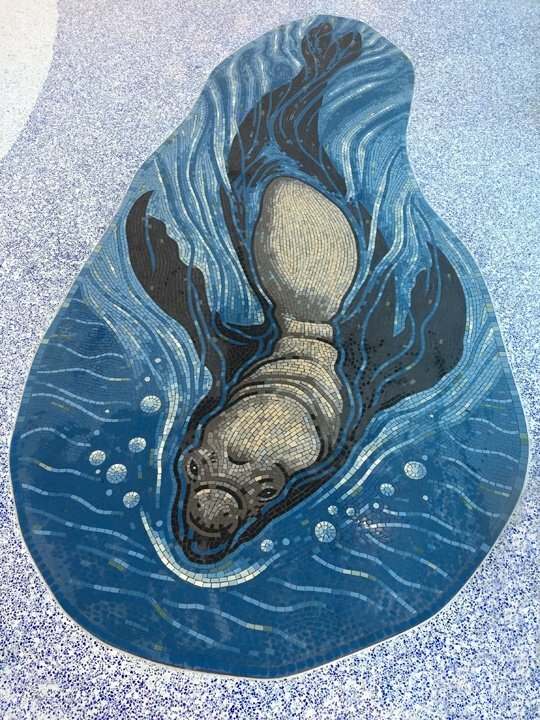 Gary begins work on the first mosaic panel, a seal chasing a mackerel which is the first mosaic panel the visitor sees as they arrive at the main entrance. 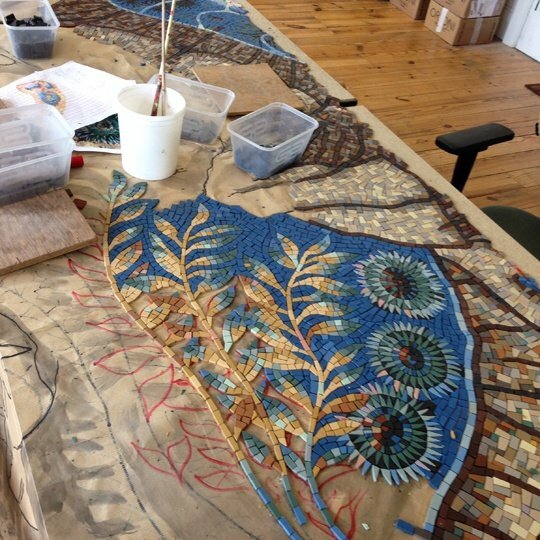 Making the kelp panel mosaic. 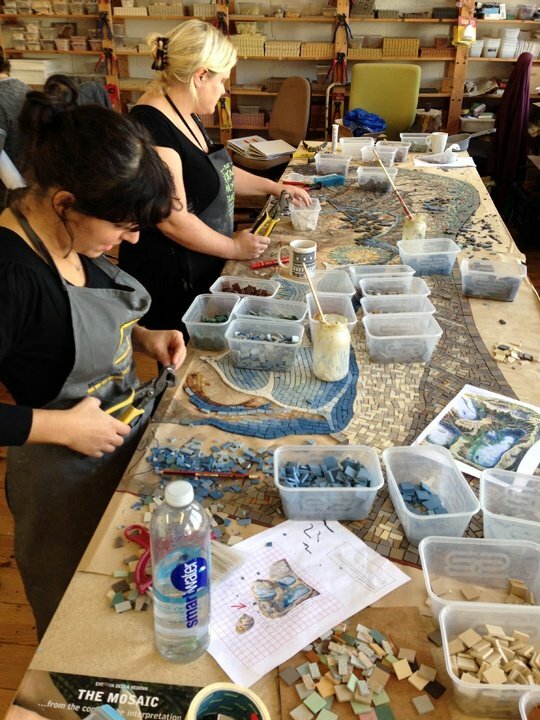 Here you can see the tesserae being glued to the full scale cartoon. 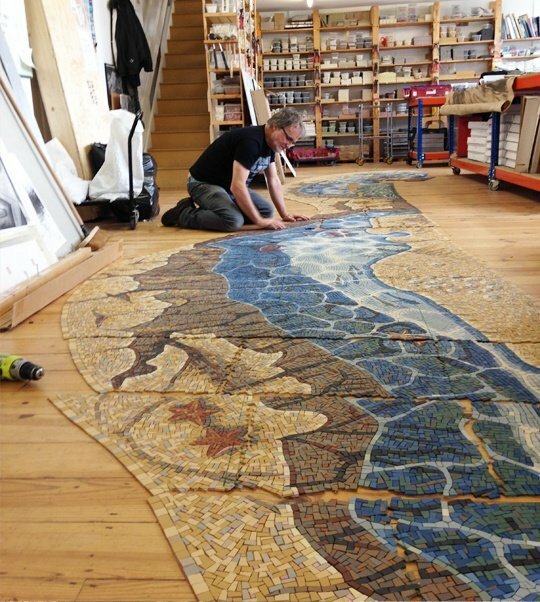 Gary in the studio checking one of the completed mosaic panels fixed on paper. 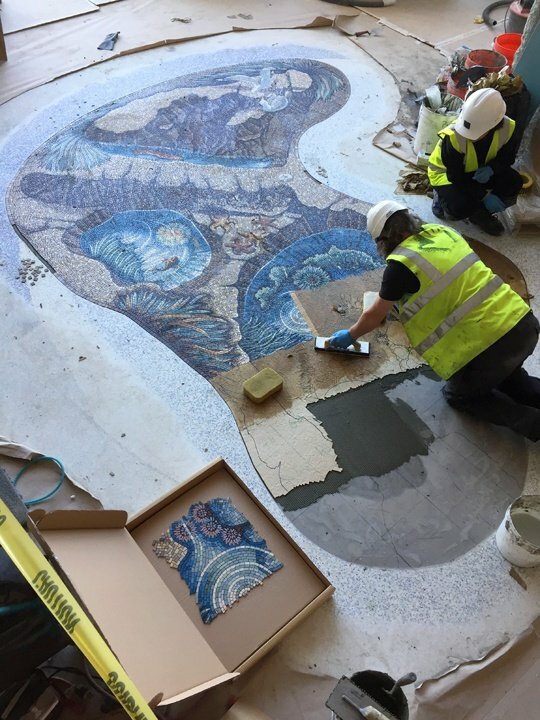 Gary and his team first arrived on site to fix the mosaic templates, the terrazzo design layout was first checked and then the rigid templates fixed to the floor. Once the templates were fixed the steel terrazzo bars could be set out before the terrazzo was laid. This was done to ensure a good fit for the mosaics. Once the mosaics were complete and the terrazzo floor ready, the mosaics were packed and shipped to the site. Gary and the team then arrived to install the mosaics. 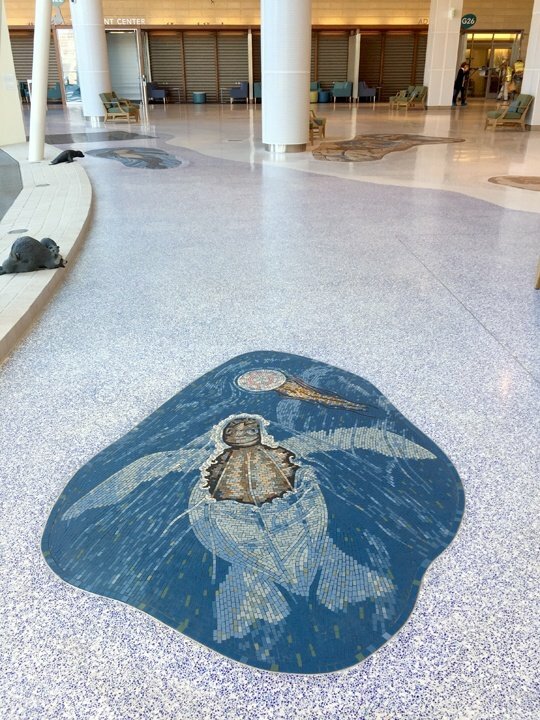 The mosaics were installed into the spaces left in the terrazzo and grouted, cleaned and sealed. Gary and Giulia Vogrig fixing the Seagull panel mosaic. You can see one of the unfixed mosaic sections in the box on the left. 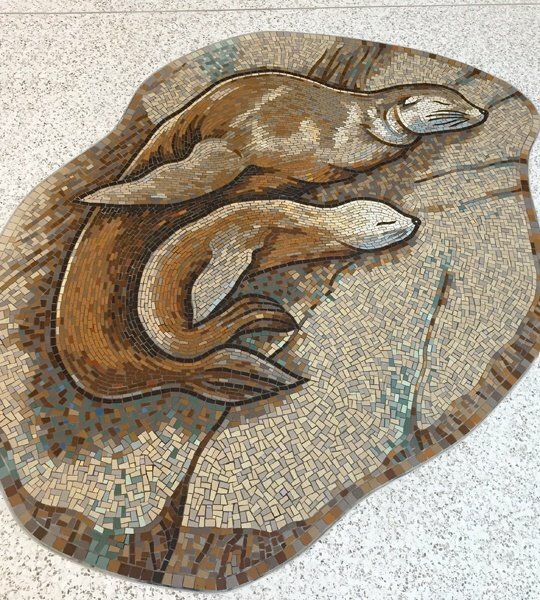 The entrance lobby, showing three of the mosaic panels: Seal and pup; The kelp tide pool; and the Elephant Seal. 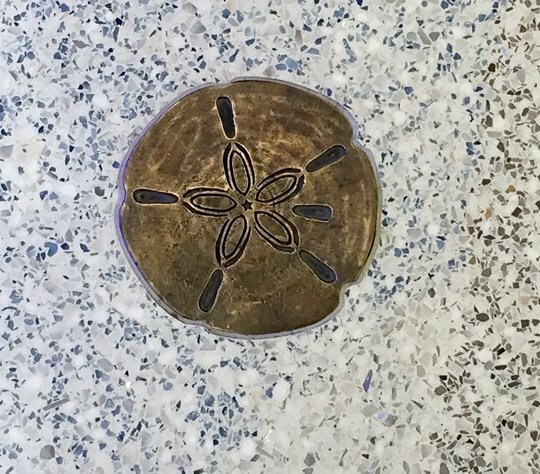 The bronze Sand Dollars were set around the reception desk. Bullwhip kelp tide pool and Dungeness Crab on Rock mosaic panels. 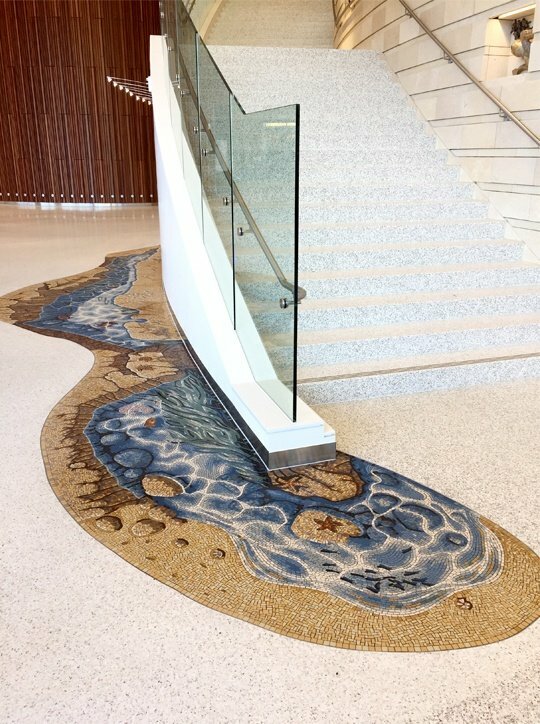 Probably the most tricky of the mosaic panels was this stair wrap tidepool mosaic which curves around the striking entrance lobby staircase. The stairs lead up to the first floor where the Redwood Forest mosaic trail is located.